A group of students from South Tyneside have starred in a national advert to recruit teachers. Youngsters from St Wilfrid’s RC College in South Shields have appeared in an advert for education charity Teach First, who have launched a national campaign to recruit teachers. The charity aims to address severe teacher shortage in science, technology, engineering, and mathematics (STEM) and Modern Foreign Language (MFL) subjects. St Wilfrid’s pupils, aged from 11 to 16 years-old, have helped write a funny, creative job advert describing what their ideal teacher is like, which has been published on LinkedIn. They have also appeared in a video advert where they are seen in a classroom setting creating the job description for their ideal teacher. Their job advert will feature on professional network LinkedIn in the hope it will tempt potential candidates into the classroom. Russell Hobby, Teach First’s chief executive said: “Teaching is an amazing opportunity to expand young minds and inspire the next generation. “With the teacher shortage we’re facing, what better way to get people into the profession than get the kids themselves to describe what kind of person they’re looking for in a teacher. Teach First says the campaign comes at a time when the UK is facing a teacher shortage when pupil numbers are booming and aims to help fill the STEM, maths and language teacher gap. 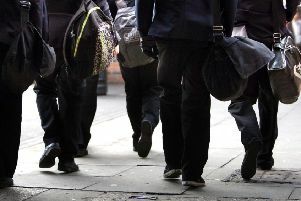 The charity says the number of teachers starting training as secondary school teachers was 17% below target and an estimated extra 47,000 secondary and 8,000 primary teachers will be needed by 2024, to maintain current pupil to teacher ratios – that’s an additional 11 teachers needed in every secondary school on average. Teach First’s November report also cited that a 78% increase in recruitment of modern foreign language teachers is needed by 2019-20. Mark Price, head of school at St Wilfrid’s RC College, said: “St Wilfrid’s has worked with Teach First for a number of years on a variety of projects. “Working closely with them has enabled us to recruit high quality Teach First candidates to the school to add to our already outstanding team of staff.